NetObjects Fusion is a code generator. What this means is the NetObjects Fusion software generates (or writes) html code so you do not have to. The process of creating/writing html code with the NetObjects Fusion software is called Publishing. NetObjects Fusion allows you to publish your web site in many ways. To Publish a page or group of pages you must first click on the Publish Site Icon. 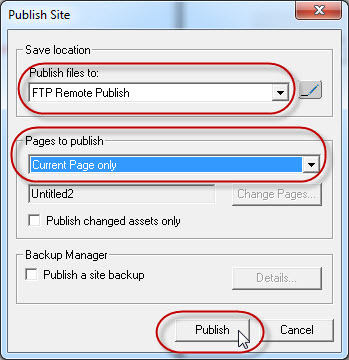 Selecting the Remote Publish option will cause NetObjects Fusion to generate HTML pages on your home computer AND FTP them to your web hosting account where they will be visible to everyone who comes to your domain. This is the option you select to get your web site Online. In order to do a Remote Publish you must first set up a Remote Profile in Fusion with your web hosting FTP information so that Fusion has access to your remote web site and can transfer documents to your web hosting domain account. You only need to set up your remote profile one time. It should not change unless you move your web site to a different hosting company. You can go over the gotFusion tutorial on how to set up NetObjects Fusion for web hosting with gotFusion which will give you an idea what you need to do. http://www.gotfusion.com/tutorials/tut.cfm?itemID=4084#fusion If you are not a gotFusion hosting customer you will need to get the FTP details from your current web host (where your domain is located). Once you have a Remote Publish Profile set up you can select it from the drop down list to connect and transfer your web pages from your computer to your domain online. These options are self explanatory in what they do. Current Page Only means to generate the last page that was viewed or worked on in Page View. If you have a web site with many pages but you have made a change to ONLY ONE PAGE, selecting the Current Page Only option can cut down on the time you need to wait for Fusion to generate and upload to your web hosting account. There is not much point creating and uploading 50 pages when you have made a change to only one page. You will find that once your site is online this publish option will be the one you use the most. Selected Page(s) option allows you to select pages within your site to generate and upload. This is useful if you have made a number of changes on a number of pages. You can select those pages to generate and upload as a group. 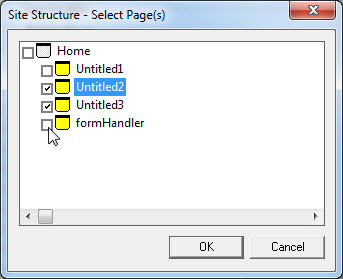 To select pages, place a check in the box in front of the page name you wish to include in the publish and upload task.